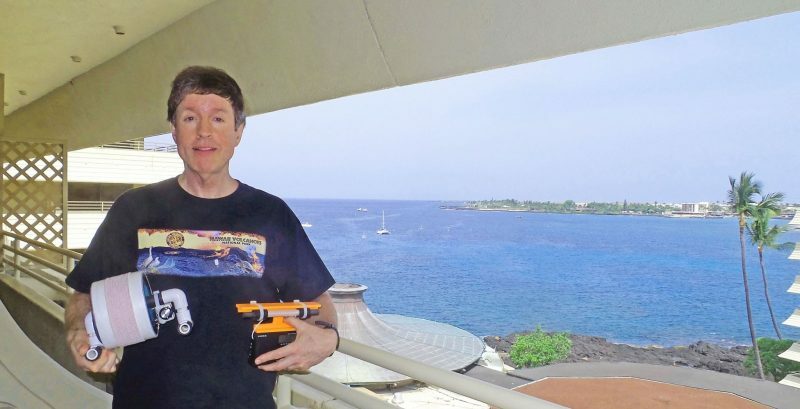 This entry was posted in AM, Mediumwave, News, Portable Radio, Recordings, Ultralight DX and tagged Baby FSL, Gary DeBock, Gary DeBock Ultralight Radio, Hawaii, Kona Hawaii, Ultralight DXing, Ultralight MW DX on April 16, 2017 by Thomas. This is the new 3.5 inch (89mm) “Baby FSL” antenna, designed to provide a powerful DXing gain boost for Ultralight radios (or any other portables) despite its very small size. 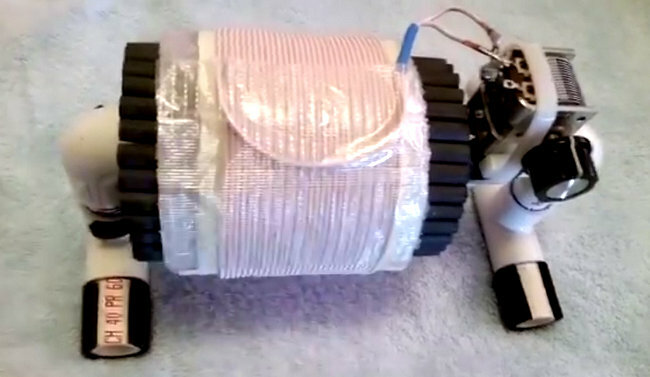 It has 32 Russian surplus 140mm x 8mm ferrite rods and 31 turns of 1162/46 Litz wire. 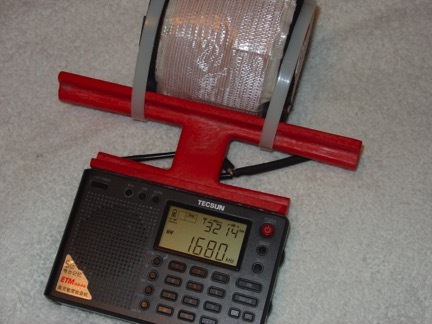 In the demonstration video it provides a daytime DX gain boost for 750-KXTG (Tigard, Oregon, 50 kW at 160 miles) from inaudible up to about S7 on the Eton Traveler III Ultralight radio. Gary is certainly a first-rate DXer and an ambassador of our radio hobby. Gary shows us here that, with a little ingenuity, we can take a $50 radio and turn it into something exceptional! Homebrewing at its best. Thank you, Gary! Also, I had never considered that a high-gain FSL antenna would require very precise placement of the receiver for proper inductive coupling. It makes sense, though. This loop is tuned for razor-sharp precision! Some day, when I have a little free time, I’m going to build one of Gary’s FSL designs. This entry was posted in AM, Antennas, How To, Mediumwave, News, Ultralight DX, Videos and tagged Baby FSL, FSL Antenna, Gary DeBock, Mediumwave, Ultralight DX, Ultralight MW DX, Videos on December 30, 2016 by Thomas. In the previous century the outstanding receivers developed by the Japanese Sony and Panasonic companies introduced many of us to the thrill of shortwave listening as teenagers, and created an unusually dedicated DXer hobby group in Japan, as well. The Japanese MW-DXing group has all along been extremely active in the hobby, although the challenge of English communication has somewhat limited their interaction with other DXing groups. Recently I was highly honored to introduce several modified Ultralight radios to the Japanese DXers, who not only tried these out with great interest, but who also designed and set up modification procedures for Japanese-made equivalents. One of the leaders in this effort was Satoshi Miyauchi, who has already built not only his own 7.5” loopstick Tecsun PL-380 model, but has also built his own 3 inch and 4.25 inch FSL Tecsun PL-380 models as well. When Satoshi-san inquired about the possibility of participating in one of our Rockwork 4 ocean cliff DXpeditions this summer (along with his friend, the famous Japanese MW-DXer Hiroo Nakagawa), I was thrilled to issue the invitation. The Rockwork 4 turnoff site on Highway 101 is a sweeping ocean view site about 419 feet (158 meters) directly above the Pacific near Manzanita, Oregon. This would be the first time that any international visitors would participate in an ocean cliff DXpedition. Our North American TP-DXing group has always had a great interest in Japanese DX and Japanese DXers, and this would be the first major North American DXpedition to feature MW-DXers from both countries. Canadian Nick Hall-Patch (of Victoria, B.C.) also was highly interested in participating with the Japanese, and as such, our 5-man DXpedition group was composed primarily of DXers from other countries (with only Tom Rothlisberger joining me as repeat American participants). Although my own DXpedition efforts started on the morning of July 5th, Nick and Tom both joined up for the session on Saturday, July 9th. We all welcomed our Japanese guests (with a joint dinner at the aptly named “Tsunami” restaurant in Wheeler, Oregon) that evening, and prepared for what we hoped would be a very memorable DXing session early the next morning. Well, it certainly was very memorable—in the worst possible way. A toxic mix of gale force winds and pounding rain was hammering the ocean cliff site as soon as we arrived for antenna setup at 1015 UTC (0315 local time), which was far and away the worst weather that any of us had ever experienced in an outdoor DXpedition. The sensible Japanese had at least brought suitable rain gear for the session, which was more than the careless North Americans had brought. Tom and I ended up thoroughly drenched and shivering as soon as the antennas were set up, while Nick was partially drenched. A single 15 inch FSL antenna was set up on its PVC base and strapped tightly down to the ocean cliff wall with heavy-duty plastic tie wraps, enabling Satoshi, Hiroo and I to track down some New Zealand, Australian and Tahiti DX with our Ultralight radios despite the vicious weather. 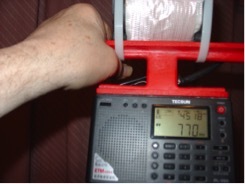 Tom’s broadband loop supports absolutely refused to stay upright in the gale force winds, and he eventually had no option other than going outside in the nasty weather to hold one of them in the vertical position manually as he recorded DX on his Perseus-SDR. Nick’s active vertical whip was relatively impervious to the vicious weather, but he was drenched from the knees down because of the pounding rain during its early morning setup. That entire July 10th session was thoroughly miserable for all of us, but both Satoshi and Hiroo showed great optimism and determination throughout the three hour struggle, which made all of us highly motivated to do the same! Fortunately, DX (and weather) on the next (and final) morning would allow our Japanese and Canadian guests to experience the South Pacific DX propagation that this cliff is famous for providing. 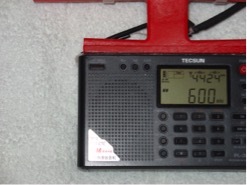 Satoshi and Hiroo became quick experts in New Zealand “big gun” stations, and Satoshi had a great thrill when 738-Tahiti pounded in at an S9 level on his homemade 3 inch FSL Tecsun PL-380 portable. Propagation definitely favored New Zealand throughout the week (in one of the most Kiwi-slanted trips that has ever been observed here). Although we had a near-daily blowtorch signal from 738-Tahiti and occasional reception from 1017-Tonga, Australian signals generally had a rough time in the NZ-slanted conditions. Tom and I both agree that overall propagation was down somewhat from the exceptional conditions we enjoyed last summer (when we enjoyed good reception of stations like 558-6WA and 558-Fiji) but the chance to welcome the Japanese DXers made the experience especially memorable, and their skill and determination was an inspiration to us all. Listed below are the DU loggings made with my Ultralight radio + FSL antenna combos, which performed quite well throughout the vicious weather challenges on July 10th (better than the drenched and shivering DXer that created them, actually). The DU loggings made by the other DXers will no doubt exceed these, but we all had great fun together, and are looking forward to the next joint DXpedition (either here, or in Japan). 585 Radio Ngati Porou (Ruatoria, NZ, 2 kW) Wispy male speech was received at 1234 on 7-6 sounding like the usual Maori announcer, but the 603 // apparently started a new song right during the parallel check. Signal nosedived thereafter. 828 3GI (Sale, Australia, 10 kW) On a couple of occasions this LR network big gun was just strong enough to confirm the parallel with 774, but most often it was in a ghostly mix with a presumed Radio Trackside (which never came up in strength for a decent recording). 891 5AN (Adelaide, Australia, 50 kW) Another underperforming Oz big gun, it was usually in a threshold-level mix with another DU English station (probably 4TAB). Three of us on the ocean cliffside pullout this morning. It took some time to set up everything as this was a new antenna and configuration for me at the cliffs, and I was planning to experiment with a vactrol for the first time. A major setback occurred when my Win10 notebook refused to recognize the Perseus hardware due to a possibly corrupt driver. To make matters worse I did not bring the backup MSI Wind U100 that I have been using for years with good results. Note to self: always bring backup. I wound up borrowing Nick’s netbook as he did not need it for experiments that morning. So it was 1222 by the time I started recording. Magic 702 was slamming in and 1KW TAB Trackside on 549 was in nicely but briefly. I didn’t think the session was as good as what was experienced last year but everything was working and signals were loud at times, usually briefly, before settling back down into the noise. Little high band action but 1503 Radio Sport was in. Driving rain and gale force winds were making things miserable. My antenna spreaders blew down time after time. For the last 15 minutes of the opening I was holding one up outside by hand, the other secured to the rock wall by heavy straps. This turned out to be a morning favoring Australia. 1116 4BC was ruling the band with huge signals, I had Aussies on 702 and 936 instead of NZ stations. The ABC News fanfare was heard on 891 on the half hour and there was audio on 1566, 1611 and 1701. This was the only of the three mornings the whole band was in although not very robust like it was last August. IDing signals is still ongoing. We were all soaked to the bone when it was over, my Gore-Tex jacket was no match for that storm. Distinguished visiting DXers Hiroo-san and Satoshi-san were still smiling at the end. That’s really the important thing, to have fun and overcome adversity. That we heard any stations at all was an added bonus. And we did hear some! We will always remember this morning. Another mostly New Zealand morning, decent signals but they would fade back down after a minute or two, and something else would become strong elsewhere on the band, one at a time. This made getting parallels for ID purposes difficult. On several frequencies NZ and Australia signals were fighting it out. It was another low band morning. 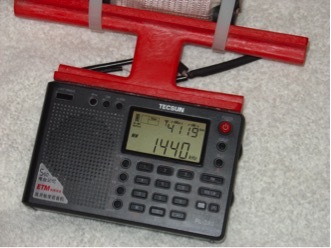 The TAB Trackside affiliate on 1224 (1 KW) was briefly good but almost nothing heard above it except for occasional audio from Radio Sport 1503. 738 Tahiti was slamming in with meter-bending signals. Satoshi-san and Hiroo-san seemed very pleased as this station is considered rare and exotic DX from Japan. Overall: 657 Star gets the award for strongest and longest lasting DU signal over the three days, beating last year’s champions 1035 Newstalk ZB and the no longer potent RNZ 567. I had more wire up this year but the signals were really no better. I failed to find a “sweet spot” with the vactrol for reducing splatter from the Portland powerhouses. Longwave: DX NDBs were practically non-existent. I am wondering if the antenna configuration made it deaf at LW, or if conditions were really that terrible. Only one DX station, 352 KHz “RG” Nikau, Rarotonga, Cook Islands was noted. 531 PI was also exceedingly weak so I suspect the antenna. I will be changing things again at my next visit to the ocean cliffs to ensure I get more LW action. 1611 // 1629 t AUSTRALIA, but who? 1216 July 10. DXing results are of course something that we really appreciate out of the DXpedition, but simply the fact that we could meet up and DXing together means a lot! And also both Hiroo and me were very much impressed by all of your efforts even in the middle of darkness and especially in the stormy weather. As for us also, it was the worst weather we ever had on the day of DXpedition! So in many ways we could get “first ever” in this joint DXpedition! We hope that we all can meet sometime in the future either at the cliff, Cliff in Japan, or any other location in the world! Thanking you once again for your hospitality, and actual support on equipments that we could use throughout the DXpedition! Wow! Gary, thanks so much and thanks to all of the team members–Hiroo, Satoshi, Tom and Nick–for sharing your experiences. Though your weather was less than desirable, it appears your DX was quite successful. You’ve so many mediumwave loggings from New Zealand, I’m convinced you were actually in New Zealand! Most impressive! Most importantly, it sounds like you all enjoyed a little DX fellowship. At the end of the day, that’s what it’s all about. We look forward to future DXpedition reports! This entry was posted in AM, Antennas, Articles, DXpeditions, Guest Posts, Longwave, News, Ultralight DX and tagged DXpedition, DXpeditions, Gary DeBock, Mediumwave, Rockwork 4 Ocean Cliff DXpedition, Ultralight DXing, Ultralight MW DX on August 24, 2016 by Thomas. In late February 2016 I completed construction of a modified version of Gary DeBock’s excellent 3 inch Mini FSL design (click here to view). This new antenna is nothing short of a AM DXing powerhouse with unbelievable sensitivity for receiving stations across the entire AM Bandwidth both day and night. The tuning of stations is razor sharp and it has stunning nulling qualities. Consultation assistance was provided from DXing experts Steve Ratzlaff and Gary DeBock on the project. The Antenna was constructed using 9 – 100 mm Ferrite Bars wound on a 2.75 inch diameter x 4 inch styrofoam cake dummy form custom made by in Vancouver, B.C. Canada – (stacy@scoop-n-save.com) for $3.50 plus shipping. The Coil wire consisted of 38 turns of high gain 660/46 Litz Wire. (Note: As can be seen 38 turns of the thicker Litz Wire left only 5/8” of room on each side of the Styrofoam Form to wire wrap the coil to the ruler frame. A longer Form ie 5” long would work much better for this build). The insulation spacer used was 2 layers of 1/8 inch Aerotape self adhesive tape which also helped hold the 100 mm Ferrite Bars onto the Styrofoam Coil Form. Inductance measured 356 uH using a DM 4070 Meter which is well within the requirement of over 300 uH for AM Band Reception. 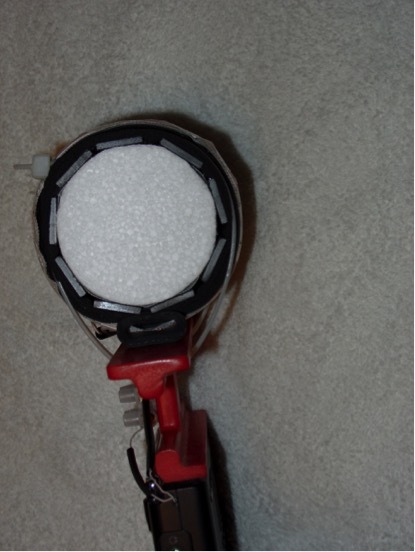 Side View Of 9-Bar FSL Antenna with 2.75” Diameter Styrofoam Cake Dummy. Because of the extra thickness of high gain 660/46 Litz Wire which is a bit too big to solder to the inside terminals of the Tecsun PL-380 Radio, a 2 Position Terminal Block was superglued to the outside of the Ruler Frame to act as an interface connection point. Both daytime and evening AM station captures have been spectacular. Stations as far away as KKOB / 770 kHz Alberquerque, New Mexico 1130 Miles from here in Winnipeg, Manitoba, Canada have been received. Country music station WSM / 650 kHz in Nashville, Tennessee 1082 miles distant is a daily evening pickup. Station KKOB / 770 kHz Alberquerque, New Mexico 1130 Miles distance. Station WSM / 650 kHz in Nashville, Tennessee 1082 miles distance. 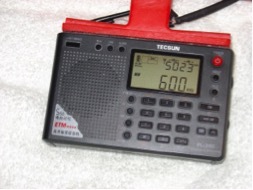 The amazing Nulling and Razor Sharp Tuning quality of this FSL was demonstrated when 2 stations at 600 kHz were received at the same time by rotating the Radio with attached FSL 90 degrees. In the North / South direction Station KSJB / Jamestown, North Dakota (219 miles distant) was received with a strong signal strength of 50 / 23. Then by rotating the Radio 90 degrees to the East / West direction Saskatoon, Saskatchewan station CJWW (442 miles distance) was captured with a similar strong signal strength of 44 / 24. 600 kHz Station KSJB / Jamestown, North Dakota. 600 kHz Station CJWW / Saskatoon, Saskatchewan. A major daily AM reception capture during the afternoon illustrating the amazing sensitivity of this antenna is 600 Watt station KKXL Sports Radio 1440 kHz (137 miles). All Indoor Reception – For Now! Due to winter conditions here in Winnipeg, all of the amazing station reception captures in this report were done inside the House facing towards the South window. 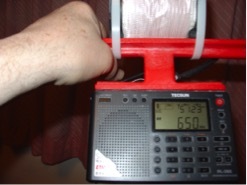 Fortunately the red ruler platform sides can he used as handles when pointing the radio in the direction of best reception. Exciting times are ahead to see how well this mini 3” FSL will perform outdoors for likely even better AM DXing. Thank you, Jerry! It’s amazing what performance you and Gary DeBock have gotten out of these homebrew FSL antennas! Thank you so much for taking the time to share your construction details and performance notes! 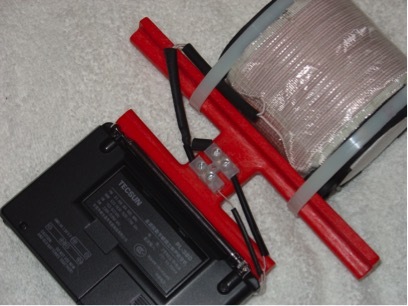 This entry was posted in AM, Antennas, Guest Posts, How To, Mediumwave, News, Portable Radio, Radio Modifications, Tutorials, Ultralight DX and tagged Antennas, Ferrite Sleeve, Ferrite Sleeve Loop, Ferrite Sleeve Loopstick, Gary DeBock, How To, How To Build a Mediumwave Antenna, Jerry Popiel, Loop Antennas, PL-380, Portable Antennas, Portable Radios, Powerhouse Mini FSL Antenna, Tecsun, Tecsun PL-380, Tecsun PL-380 Ferrite Sleeve Loop, Ultralight DXing, Ultralight MW DX on March 23, 2016 by Thomas.